TS EAMCET 2019 Answer key, Results/ Rank cards / Question Papers, Preliminary key-Telangana EAMCET 2019 Results/Rank cards: Engineering, Agriculture and Medical Common Entrance Test (EAMCET) is conducted every year by Jawaharlal Nehru Technological University Hyderabad on behalf of TSCHE. This examination is the prerequisite for admission into various professional courses offered in University/ Private Colleges in the state of Telangana. AN : 3-00 P.M. to 6-00 P.M. The Candidates who were applied for this stream, they were attended the entrance test and they are waiting for their results. The JNTU Officials have to be uploaded the h results of eamcet aspirants. So, candidates can access their results from the official website only. Telangana EAMCET 2019 results to be announced soon. Telangana State Engineering, Agriculture & Medical Common Entrance Test, TS EAMCET 2019 Results are expected to be released this week. The results would be declared by the Jawaharlal Nehru Technological University, JNTU Hyderabad on behalf of TSCHE. The examination was conducted by JNTU on May ... Results are expected to be released soon on eamcet.tsche.ac.in.The Preliminary Answer keys were released and objections invited till May.., 2019. Candidates who have appeared in the examination conducted by the board can check the result updates on the official website. There is, however, no suggestive date provided by JNTU for the results as yet. 4. In the TS EAMCET Results/ TS EAMCET Rank cards Page, Enter your Hall ticket number along with your date of birth in the required field. TS EAMCET 2019 was conducted across the country. The Telangana State Council of Higher Education (TSCHE) will soon release the answer keys for the state Engineering, Agriculture and Medical Common Entrance Test (TS EAMCET). Candidates who have appeared for the paper can check their results from the official website and visit this page again to be notified when the results are declared. TS EAMCET 2019 was conducted across the country by the Jawaharlal Nehru Technological University (JNTU), Hyderabad. Candidates who clear the paper will be eligible for admission in BE, BTech, BSc courses in Agriculture and Technology at various recognised institutions in the state. Candidates can submit objections to questions once they have gone through the answer key which is likely to be released tomorrow. The EAMCET paper was leaked twice since last year which caused the exam to be held thrice. Since last year, the EAMCET paper was leaked twice and the exam was held three times, the authority has ensured leak-proof exam and strict measures to prevent such irregularities is introduced. The exam will be held in 27 centres. The Preliminary Key for TSEAMCET 2019 examination conducted and will be available at www.eamcet.tsche.ac.in from 10.00 PM today. The objections on the Preliminary Key, if any, may be uploaded. “The Objections on preliminary key have to be submitted through online mode only,” the university said in a notice published on Saturday adding that other modes will not be entertained for the submission of objections. The TS EAMCET Convener also specified that objections should be submitted with proper justification. Steps to check answer key for TS EAMCET 2019: Go to the official website for TS EAMCET (eamcet.tsche.ac.in). ; Click on the link for the “Preliminary Keys”. ; Select between “Preliminary Key for Eng” and “Preliminary Key for Am”. ; Download the key and check your answers. Step 1: Go to the official website of TS EAMCET (eamcet.tsche.ac.in). Step 2: On the homepage, click on TS EAMCET 2019 answer keys. Step 3: Enter your registration number and other details. Step 4: The hall ticket will be displayed. Step 5: Download and take a print out. Step 1: Go to the official website for TS EAMCET (eamcet.tsche.ac.in). Step 2: Click on the link for the “Preliminary Key objections”. Step 3: Enter your registration and hall ticket number in the fields provided and login. Step 4: Submit objection and keep a copy for further reference. TS EAMCET 2019 exam was conducted by JNTUH on behalf of the Telangana State Council for Higher Education (TSCHE). The Jawaharlal Nehru Technological University Hyderabad (JNTUH) has released the results for the Telangana Engineering, Agriculture and Medical Common Entrance Test (TS EAMCET) 2019. Candidates who have appeared for the exam can check their result from the official website and check here for updates. The TS EAMCET 2019 exam was conducted. The Engineering exam was held from 10 am to 1 pm and and the Agriculture and Medical exam was held from 2.30 pm to 5.30 pm. Enter your registration number and hall ticket number in the fields provided. Candidates who clear the exam will be eligible for admissions into various courses except MBBS and BDS in the state of Telangana. For admission in medical colleges, the students had to appear for NEET which was held. The answer keys for TS EAMCET are available on the official website and candidates had until May 16 to submit objections. 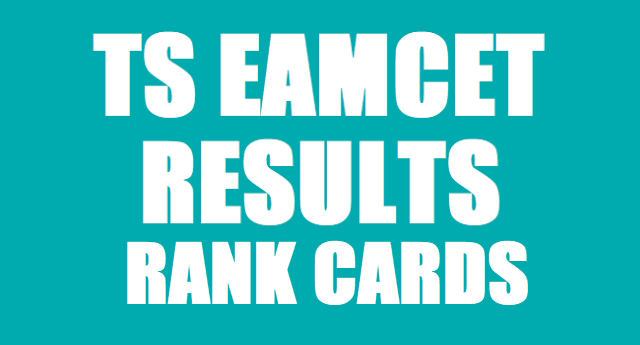 Steps to download the TS EAMCET 2019 results: Go to the official website for TS EAMCET 2019 (eamcet.tsche.ac.in). ; Click on the tab for the 2019 results. ; Enter your registration number and hall ticket number in the fields provided. ; Type the code and click on submit. ; Download the results and take a print out of the same for further reference. A) BE, BTech/BTech (Bio Tech)/BTech (dairy technology)/BTech (ag engineering)/ B Pharmacy/BTech (food technology (FT)/BSc (Hons) agriculture/BSc (Hons) horticulture/BVSc and AH/BFSc. this is 2017 and telangana eamcet 2017 results are already released. keep updatedining i checked my ts eamcet 2017 results already from another website.